Aertsen Ivo and Pali Brunilda (eds.) (2017). Critical Restorative Justice. Hart Publishing: London. Pali Brunilda (2017). Towards integrative frameworks for addressing sexual violence: Feminist, abolitionist, social harm and restorative perspectives. In Restorative responses to sexual violence: Legal, social and therapeutic dimensions, edited by Estelle Zinsstag and Marie Keenan. Routledge: London, pp. 28-43. Pali Brunilda (2017).‘Cultural’ problematisations in the restorative justice discourse. 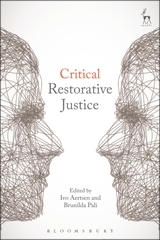 In Critical restorative justice, edited by Ivo Aertsen and Brunilda Pali. Hart publishing: UK, pp. 175-191. Pali Brunilda and Pelikan Christa (2014). Con-texting restorative justice and abolitionism: exploring the potential and limits of restorative justice as an alternative discourse to criminal justice. Restorative Justice, 2: 142-164. Pali Brunilda and Sten Madsen Karin (2011). Dangerous liaisons? : A feminist and restorative approach to sexual assault. TEMIDA, 14 (1): 49-55.